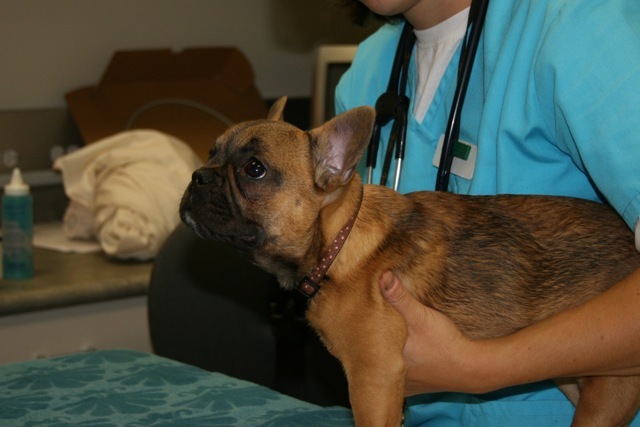 Part 4 of our article on French Bulldog health and genetic conditions is on congenital heart defects. Heart issues are among the most traumatic for owners and for breeders. The puppy pictured above is Ema, a rescue French Bulldog from a Quebec puppy mill. Ema was afflicted with severe pulmonary stenosis and an atrial septal valve defect. In spite of the best efforts of the vets at the University of Guelph, Ema did not survive Cardiac Surgery. You can read more about her care here. There are many types of heart disease that can affect your dog, and one of the more serious of these is a condition known as cardiomyopathy. There are several types of this fatal disease, and they are a major cause of irregular heartbeat (arrhythmia), congestive heart failure and sudden death. The two most common include a condition known as arrhythmogenic cardiomyopathy (ACM) and a second known as idiopathic dilated cardiomyopathy, or DCM. In many cases, the dog will develop ACM first, and then the condition will develop into DCM. DCM is a disease of the heart muscle that results in weakened contractions and poor pumping ability. As the disease progresses the heart chambers become enlarged, one or more valves may leak, and signs of congestive heart failure develop. The cause of DCM is unclear in most cases, but certain breeds appear to have an inherited predisposition. Large breeds of dogs are most often affected, although DCM also occurs in some smaller breeds such as cocker spaniels. Occasionally, DCM-like heart muscle dysfunction develops secondary to an identifiable cause such as a toxin or an infection. In contrast to people, heart muscle dysfunction in dogs and cats is almost never the result of chronic coronary artery disease (“heart attacks”). Early in the disease process there may be no clinical sign detectable, or the pet may show reduced exercise tolerance. In some cases, a heart murmur (usually soft), other abnormal heart sounds, and/or irregular heart rhythm is detected by your veterinarian on physical examination. Such findings are more likely as the disease progresses. As the heart’s pumping ability worsens, blood pressure starts to increase in the veins behind one or both sides of the heart. Lung (pulmonary) congestion and fluid accumulation (edema) often develop behind the left ventricle/atrium. Fluid also may accumulate in the abdomen (ascites) or around the lungs (pleural effusion) if the right side of the heart is also diseased. When congestion, edema and/or effusions occur, heart failure is present. Weakness, fainting episodes, and unfortunately, even sudden death can result from heart rhythm disturbances (even without “heart failure” signs). A heart murmur is an abnormal heart sound, usually heard by listening to the heart with a stethoscope. Generally, this is first heard when the dog is a puppy and is sometimes referred to as a ‘puppy murmur’. A heart murmur is caused by turbulent blood flow within the heart. Sometimes a murmur is determined to be ‘innocent’ or ‘physiologic’, while other times the murmur is determined to be pathologic or caused by disease. Pathologic heart murmurs can be caused by a structural problem within the heart (i.e., cardiac disease), or can be due to a problem that is ‘extracardiac’ (i.e., not caused by heart disease). Some heart murmurs can be outgrown, and these are referred to as ‘innocent’ or physiologic heart murmurs. It is very common for young puppies to develop an innocent heart murmur while they are growing rapidly. The murmur may first appear at 6-8 weeks of age, and a puppy with an innocent heart murmur will usually outgrow it by about 4-5 months of age. This type of murmur is benign. In general, a physiologic or innocent heart murmur will have a low intensity (usually Grade I-II out of VI), and does not cause any symptoms or clinical signs. Puppies found to have a physiologic heart murmur are generally re checked every other month, until the condition disappears. Other heart murmurs are indicative of more serious congenital heart defects, caused by a malformation of the structure of the heart. With structural heart disease, there is some sort of abnormal structure or defect that is disturbing the flow of blood, creating turbulence. The abnormality in the heart may be a leaky heart valve, a thickening or narrowing of a valve or large blood vessel, or an abnormal hole between the heart chambers or between two arteries that are not normally connected. Some of the congenital heart diseases in dogs are hereditary in certain breeds of dogs (note: including French Bulldogs), and include diseases such as ‘sub-aortic stenosis’, ‘pulmonic stenosis’, and ‘patent ductus arteriosis’. Other congenital heart diseases are not as well documented as being hereditary, including ‘ventricular septal defects’, ‘atrial septal defects’ and ‘Tetralogy of Fallot’. The most common cause of an acquired heart murmur in the dog is ‘mitral insufficiency’ (also called ‘mitral regurgitation’), a condition in which the mitral valve becomes thickened and begins leaking (see handout ‘Mitral Valve Disease in Dogs‘) – mitral insufficiency tends to be more common in small breed dogs. Other causes of an acquired heart murmur in older dogs include bacterial endocarditis, caused by a bacterial infection that localizes on a heart valve and dilated cardiomyopathy (see handouts on ‘Endocarditis in Dogs‘ and ‘Dilated Cardiomyopathy in Dogs‘). OFA offers cardiac screening certification via examination by echocardiogram and Doppler echocardiography. OFA does not perform examinations, but serves as a database for the information obtained.